The Surgiderm range is based on their patented cross-linking process called “3D Hyaluronic Acid Matrix Technology”, which allows a tighter and more uniform skin. The dermal hyaluronic fillers are used to smoothen fine lines, medium and deep wrinkles, create volume and contour the lips, as well as model the face as a whole and they have a high degree of elasticity and ensures a long lasting effect in 9-12 months. The Surgiderm products are produced on the base of stabilized, monophasic hyaluronic acid. The advantage of those hyaluronic fillers is their compatibility with other hyaluronic products. This dermal hyaluronic filler can be injected without having to wait for any previously inserted hyaluronic fillers to biodegrate. 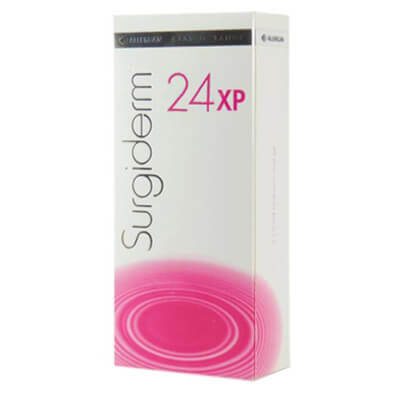 Surgiderm 24XP is an injectable hyaluronic acid based dermal filler used to volumise the skin via a mid-dermis injection, as well as for defining and enhancement of the lips. Surgiderm 30XP is an injectable hyaluronic acid based dermal filler used to add volume to the mid- and deep dermis of the skin and for defining and adding volume to the lips. 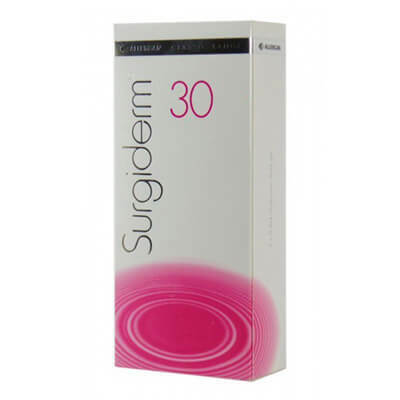 Surgiderm 30 is an injectable hyaluronic acid based dermal filler used to reduce wrinkles and deep skin depressions around eye, lips, mouth, chin and cheek.